Now the talk of the town and a popular fad among Nigerian youngsters and showbiz celebrities is the newly launched face Cap by foremost Disc Jockey, DJ Jimmy Jatt (Jimmy Amu). The Jimmy Jatt “DJJJ” Snap-backs by Marco Martinez was launched on Friday February 10, 2012 at the posh pub, Swe Bar, Onikan, Lagos. The event which recorded am impressive crowd within the showbiz industry, was also the official launching of the video of the ace DJ new single “Komije” which featured rap heavyweights such as Sauce Kid, Orezi and Muna. sleeves in 2012. Already, some celebs have been spotted wearing it. The amiable Dj is also forming an alliance with Nigeria’s widely circulated and popular youths/campus magazine, ACADA. 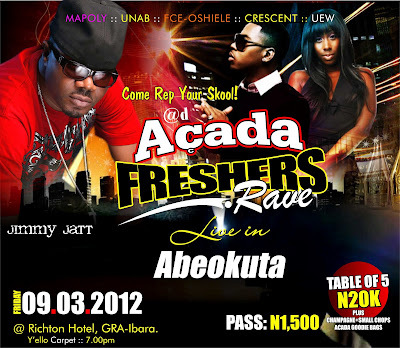 The relationship will see Jimmy Jatt headlining the magazine’s youth/campus show tagged “ACADA Freshers Rave”. According to the publisher of the youth magazine, Biodun Caston-Dada, “we are partnering DJ Jimmy Jatt because of his professionalism and humble mien. This is about the first time this will be happening in Nigeria where a DJ will headline a major show instead of the regular musical acts. We are just been innovative and bringing a twist to the game. It is also an avenue to showcase the importance of a DJ which many have relegated to the background in showbiz”. He further stated that the Freshers Rave is packaged to welcome fresh intakes and students into the higher institution. The rave is been planned to be taking to major cities across the country. Aside musical performances, there will be raffle draws where attendees will win various gifts items ranging from 21” Colour TV set, Mobile Phones, BlackBerry, DVD Players, Pressing Iron, Recharge Cards and many other choice gifts. The first leg of the Freshers Rave comes up on Friday 9th March, 2012 at Richton Hotel, Ibara Housing Estate, Abeokuta. It is supported by MTN Nigeria, Nescafe, Indomie Noodles, UB Cosmetics, Goldmyne Limited amongst many others.